Icebergs anchor in St. Anthony Bight, St. Carol’s and Great Brehat! Icebergs are a common sight on the tip of the Great Northern Peninsula – it is the iceberg alley after all! The best viewings of icebergs surround L’anse aux Meadows, St. Anthony, Conche, Englee and surrounding communities. On a visit to St. Anthony in June, I detoured to St. Anthony Bight, St. Carol’s and Great Brehat. I was only to be impressed by the vernacular architecture, fishing boats and stages, wood piles and of course squid drying and icebergs nestled in the Bight – rural living at its finest! St. Anthony-Bight has a 100 year old house owned by Mr. John Pilgrim. The St. Anthony-Bight Loop Trail is located about 2 km outside the community and is well-maintained. St. Anthony-Bight is also known as the “Iceberg Graveyard”, as icebergs come to rest in the coves and melt. Many people are sure to get their hands on the beloved bergy bits and use the iceberg ice to add iceberg ice to a beverage. Just a few kilometres away is the community of St. Carol’s, which has a hiking trail that leads to John Patey’s Cove where there is a great view of icebergs and whales. A population of less than 60 residents today, still boasts a strong fishing community. I had the pleasure of seeing squid left to dry on the flake on this particular day. A little further down another road is Great Brehat (pronounced Braha). This community like the others, where heavily influenced by the French in the 17 and 1800’s as fishing stations. Great Brehat has a walking trail behind the local cemetery known as Flat Point Lookout and there is also another trail leading to Little Brehat (which one of our many NL re-settled or ghost communities). The presence of the fishery still remains a big part of this community, although some of the smaller stages and wharves are being lost to the perils of harsh weather. These three communities are on the outskirts of the Town of St. Anthony, recently became connected to the digital world via broadband Internet and they are between L’anse aux Meadows World UNESCO Site. 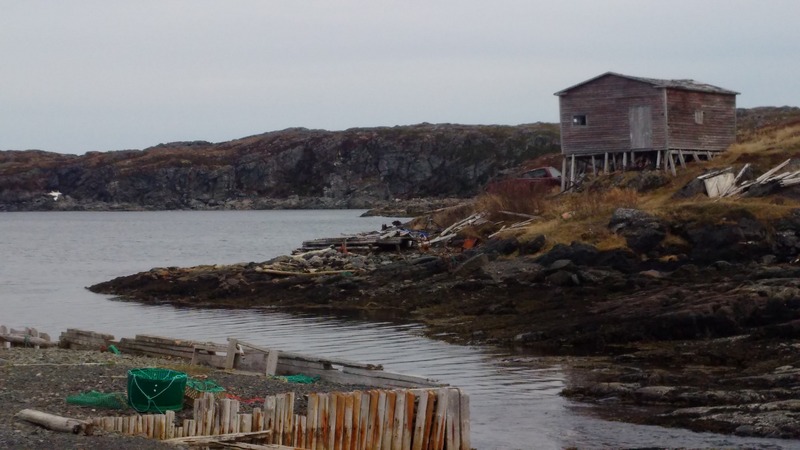 On your visit to the Great Northern Peninsula these may be communities you will want to visit to see rural living and icebergs, or you may just want to stay awhile longer. Posted on August 16, 2015, in Community Economic Development, Heritage, Landscapes/Geography and tagged fishing, great brehat, Great Northern Peninsula, Iceberg, Newfoundland, St. Anthony, st. anthony bight, st. carol's, Travel and Tourism, walking trails. Bookmark the permalink. Leave a comment.